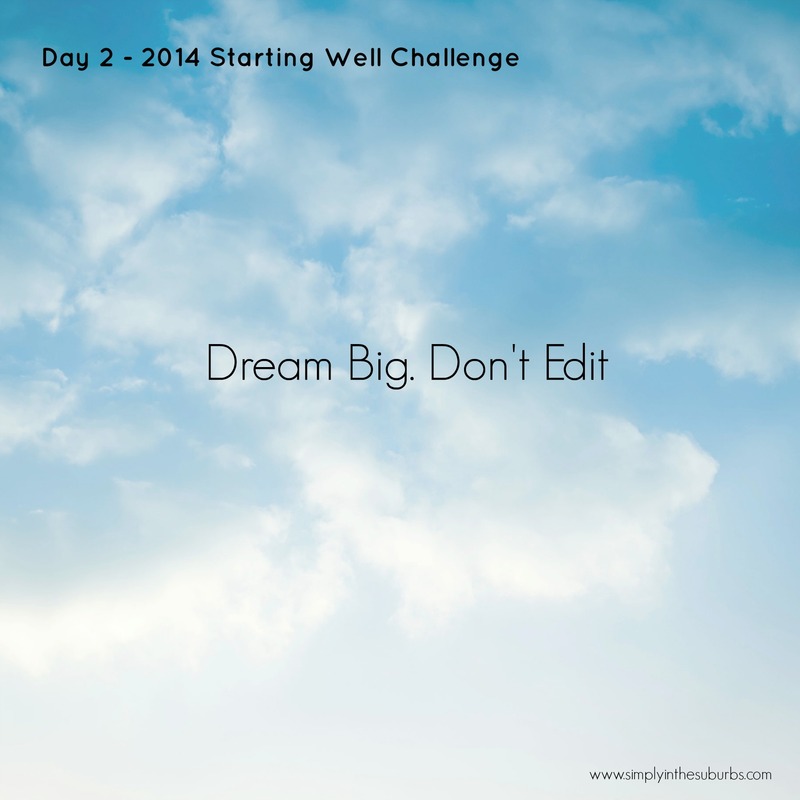 Day 2 of the Challenge is all about dreaming. Having reviewed your previous year, you have a good idea about what you did or didn’t accomplish. Hopefully it was an encouraging process, even if you had to face a few missteps or failures. Either way, 2013 is gone. 2014 is a new year. Enjoy the freedom of a clean slate. Let’s play with that clean slate. Today is about learning to stretch yourself and your ability to dream up the goals, projects, and outcomes you’d love to see happen this year. Today is about writing out anything and everything WITHOUT EDITING. This ain’t time to analyze. Write down anything that’s been on your radar. Don’t stop to think whether it’s actually a possibility this year. Don’t worry about whether you have the resources financially or otherwise. If you need a nudge, use the list above or the prompts at the end of this post. Create a list of projects, goals, dreams, and outcomes you’d like to see in 2014 (or beyond). Use the Day 2 Worksheet or a journal and write them all down (we’ll talk about logging them electronically later, but today is more about intuition, not analysis). Use bullets. Just click goals and projects off, brainstorm style. If you run out of steam in 5 minutes, just sit in the discomfort until you think of something else. Use the prompts. Besides developing the raw material for the remainder of the Starting Well Challenge, doing this exercise stretches a muscle we don’t use so often. We don’t imagine possibilities enough. I’ll speak for myself – I don’t imagine possibilities enough. Creating your list will stretch that bit of your heart and mind. These goals and projects and outcomes will inform what we do from here in this process. But for now, we’re going to let the list marinate for a day or two. If something else hits you at any time, add it to this list. Have you ever said, ‘I’ve always wanted to do __________________’. What did you talk about doing ‘someday’ in college or high school? What talent do you want to be courageous with this year? Do you write out your goals or projects on a regular basis? Do you stick to necessary goals or do you allow yourself to go to the edge? Share something from your list if you’d like. Tomorrow we’ll take a moment to look at the roles we play and the various areas in our lives (i.e. health, career, faith). While the goal and project list simmers in the background, we’ll take a look at how we currently structure our worlds. To get email updates for the remainder of the Starting Well Challenge, click here.